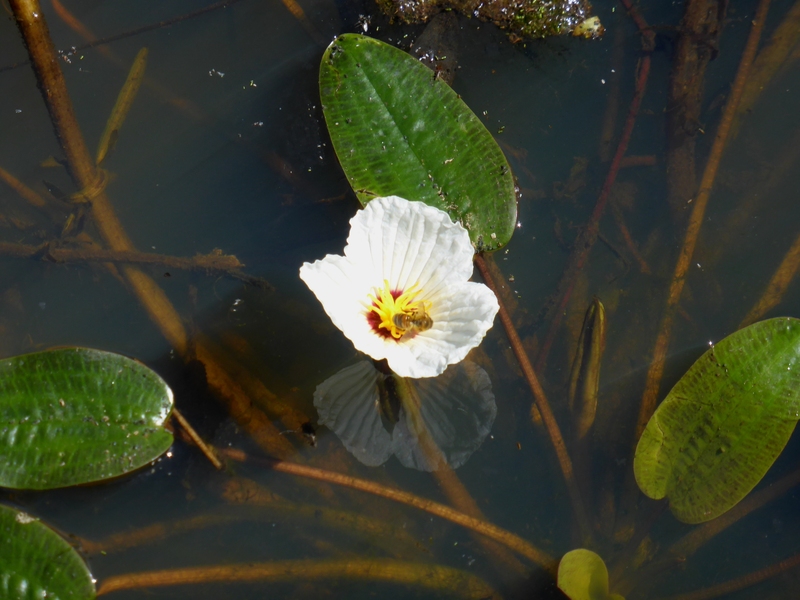 Ottelia ovalifolia, Swamp Lily, is a tufted aquatic perennial with floating and submerged leaves and flowers. The visible leaves are strap-like, up to 16 centimetres long and six centimetres wide. Plants produce two types of flowers. One does not emerge and self pollinates without opening. The other is held, above the water, on a stalk up to 30 centimetres long. These visible blooms are five centimetres across, three-petalled, cream with a red centre and appear between November and March. The flower stalks bend into the water after pollination and the wall of the fruit disintegrates and releases the seed. The Swamp Lily has eye-catching flowers. The species could be grown in ponds or water-holding pots. Two plants came up in one of our dams without human intervention. Perhaps the seed was carried on the feet of ducks or other water birds. Ottelia ovalifolia is widespread in NSW and is also found in mainland states and territories. Swamp Lily is naturalized in New Zealand. Ottelia is the Latinised form of the word ottel-ambel, the southwest Indian name of a local species.